The Average Woman Does Not Use 60% of Her Closet - Is It Time to Join the Resale Revolution? The average woman has at least £2,400 worth of clothes that hang in her wardrobe untouched. With some resale websites suggesting that women have as many as 19 items ready to sell at any one time. Many of us are now making the most of the money hanging in our closets, and using fashion to empowers us financially by joining the resale revolution. This means selling our pre-loved clothes on peer-to-peer e-commerce sites. Here at OnBuy we have compiled data taken from fashion resale websites, google trends and retail reports, to look into the second-hand women's clothes trend, and how it could be saving the environment too. Studies show that women bought on average 37 items in 2016, compared to 51 in 1996. 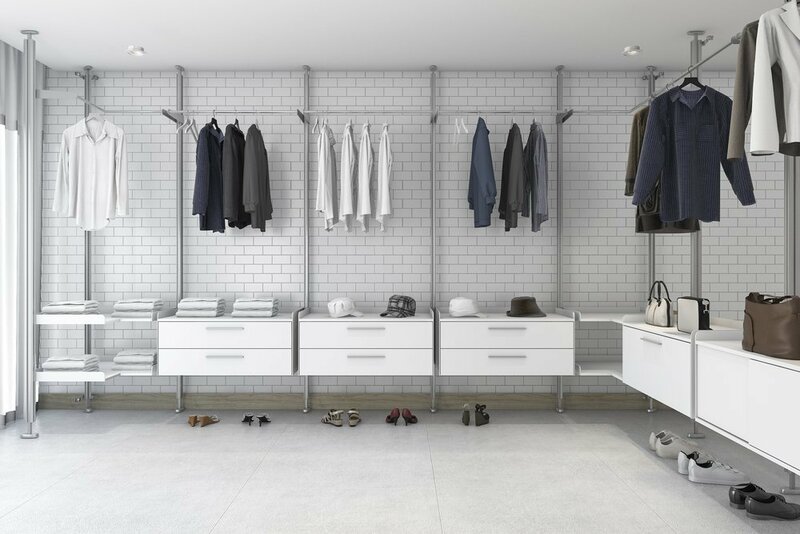 This dramatic decrease reveals a lot about the growing trend of minimalism and ‘capsule wardrobes’, or wardrobes that contain only essential items that are classic in style, so never go out of fashion. This increasing interest is also demonstrated when looking into google search trends; the words ‘capsule wardrobe’ garners 60,500 google searches a month. There is clearly a desire to cut back on clothing splurges and curate the perfect closet. Lifestyle and fashion vloggers have even addressed the topic, with around 203,000 YouTube videos dedicated to the subject. Not only can you stay on top of the trend by selling your unwanted apparel online, but you can make money too by shopping on online resale websites. A study revealed that if you shopped second-hand exclusively for one year, you could save a staggering £1,652. Add this to the £2,400 worth of saleable clothes you have in your wardrobe and you could end up with a beautifully minimal and carefully chosen closet, as well as £4,000 in the bank. The industry as a whole has an estimated worth of £14 billion, and is expected to reach £25.6 billion by 2021. This rise in peer-to-peer marketplaces online would suggest that we are taking to the internet to offload our old outfits, as 49% of the resale market is taken up by clothing, accessories and shoes. But the rise in reselling couldn’t exist without a simultaneous increase in second-hand shoppers. Interestingly, the main market for pre-loved clothes isn’t the older generations, but millennials. In fact, 3 in 10 millennials have shopped second-hand in the last year. Another interesting fact to note, is that many of these shoppers aren’t people looking to save cash. Research reveals that 2017 has seen an increase in so-called ‘high-income thrifters’, who are 35% more likely to try used clothing websites than low-income shoppers. Last year, the UK saw a 9% increase in the carbon footprint of clothing from 2012. This can be down to, in part, the relatively low price of fashion, and an increasing population. However, reselling your clothes could offer a solution to textile waste as stats reveal that, on average, we dispose of 70kg each in the span of one year. Resale and recycling offer carbon savings because the lifetime of clothing that is re-used or recycled is extended. Where this displaces a sale of a new garment, the effects on the environment from processing are avoided. With apparel having an average lifespan of 3.3 years, and an average time in our wardrobes of just over 1 year, there is certainly room to give your clothes a longer life-span and avoid them becoming waste. However, becoming a successful closet entrepreneur, or someone who makes a profit from the clothes they sell online, takes a little insider know-how. Here are some tips on how to sell your products online successfully. Offer online discounts: 94% of women say they rarely buy clothing that’s not on sale. Make sure you take nice photos: take photos with you in the clothes so a buyer can get a feel for what they will look like on them. Get social: 39% of consumers said that social networks provide their main inspiration for purchases, so make sure you are up-to-date with Instagram trends, and even promote your online resale store on your social media channels. Keep an eye out for trends: The brands with the best resale value are Michael Kors, Kate Spade and Tory Burch among others. In general, designer labels less than 2 years old can make you the most money. Be honest: make sure you make a potential buyer aware of any wear and tear, otherwise you could risk getting your account suspended because of a disgruntled customer. Sell activewear: Last year, gym and sportswear was the fastest growing category of clothing, probably to meet growing demand for fashionable fitness ensembles. Put clothes on at the right time: Research revealed that most second-hand thrifters shop between 9pm and 10pm.